Need an exciting break from your busy schedule? Get to the airport then. Nah, not to fly for a vacation, but to catch your racing dreams by go-karting with your squad. Rajiv Gandhi International Airport is apparently the first and the only airport in the country that can boast of a go-karting track. Calling all the thrill seekers are two racing tracks of 600 metres (for recreation) and 900 metres (for professional championships), this is open till midnight and on some days, beyond midnight too. This fun, adrenaline-pumping activity will not only help you unwind, but it is also a great way to improve your reflexes and connect with your family. Perfect for a weekend outing, go here if you like to experiment with speed and enjoy some twists and turns along the way. They have three kinds of packages for the racers and they depend on the kind of cart and the time spent racing. They have baby carts, level 1 7Bhp Karts, and twin carts and you can choose between seven to 15 laps for the race. If you’d like to spend more than just half an hour here, you can also book the exclusive packages and can race till your heart’s content. 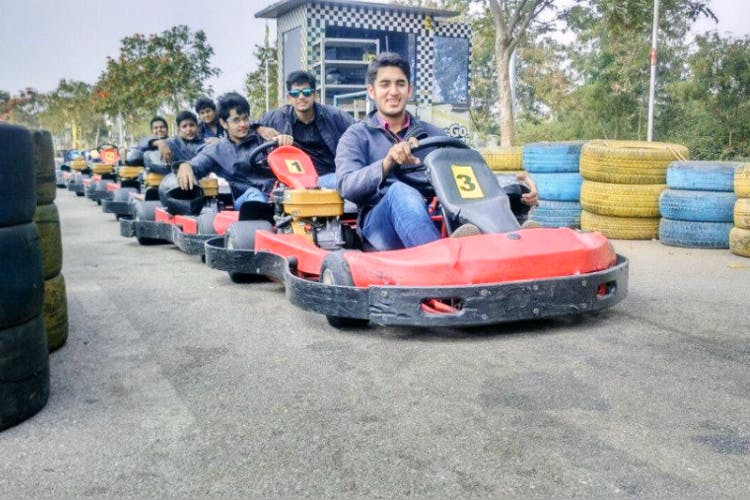 If you have a massive squad or if it’s a corporate event or party that you want to make out of go-kart racing, the bulk packages will come in handy for you can book up to 60 tickets at once. The prices vary based on your booking, of course, but the range is anywhere between INR 350 (for 7 laps in a baby cart) to INR 1,12,520 (for full day exclusive). You can check out other sports like shooting, zorbing and wireless car racing at the airport. If the bookings are for large groups, it is ideal to do them in advance via phone call and check out more information on their website.